When a user needs to look for an image, the first search engine that usually crosses their mind is Google Images. It’s something that many of us probably do without thinking twice about it. It’s as if our fingers had a mind of their own and automatically typed in words Google Images. Like Google Image Search, Yahoo Image Search also exists. Yahoo also has images for us as well. It’s obviously not as popular as Google, but it gets the job done. 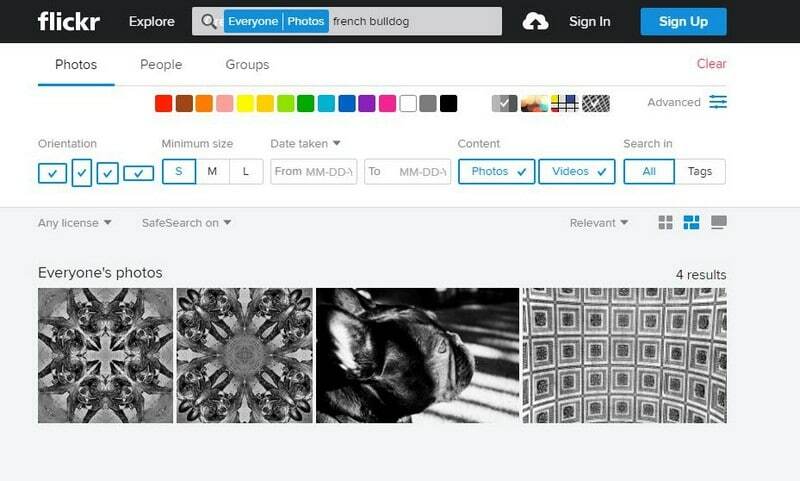 It can also offer custom sized pictures as well and help you find images that have more of a particular color. Sometimes you need the pictures to be of a certain size or to be of a specific type, and if you just scroll through the see of general results, you’ll be at it forever. Thanks to the Yahoo image search tool you are going to find in Yahoo Images, it is going to make your search the results a lot more useful. Yahoo Image Search Tips: How to Search for Custom Size Images on Yahoo? If you compare Yahoo and Google images side by side, you’ll see that Yahoo has more to offer. When you type in let’s say ¨French Bulldogs¨ on Yahoo, you don’t just get the pictures but more search options without having to click anywhere else. But, if you don’t see the advanced options right away, it is located on the upper right-hand corner. Google Images, on the other hand, makes you do some extra clicking to get more accurate results. Not that it’s a lot but the less clicking you have to do the better, right? After you get your results on Yahoo Images, you can choose between color, size, and type. In Color, you can choose what color you want the pictures to have. For example, you can make a choice between Red, Orange, Yellow, Green, Purple, Pink, Black Grey, white, or black and white. In Size, well, that pretty self-explanatory and in type, you can choose from a variety of options. You can choose between Photo, Graphics, Animated GIFs, Face, Portrait, Non-Portrait, Clipart, and Line Drawing. If you can’t see the full name of the type, just put your mouse cursor over it, and it will automatically appear. Let’s say you are looking for images that need to be of a certain size. Yahoo Images has some very useful filters that I think you are going to like since they are mind-numbingly simple. That way, the only pictures you are going to see in the search results are the images with the dimensions you specified. After that, the only thing you need to do is decide which of all the images you are going to use. Let’s go back to the Size feature I mentioned earlier, shall we? There are only three to choose from such as Small, Medium, and Large. Unfortunately, there is no feature to type in an exact size that you might be looking for. That used to be a feature that Yahoo Images used to have, but for some reason, they decided to get rid of it. So, if an image has to be an exact size, looks like there is no option but to use a photo editor. On Yahoo images, the only way to see the exact size of a picture is to click on it, unlike Google Images where you only need to put the cursor over the image. Other useful features you are going to find in Yahoo Images is Safe Search. With this feature, you can block inappropriate and adult-oriented content from the Yahoo search results. There are things that kids shouldn’t see, and this tool will help prevent those images from being seen by them. This is a great feature to enable for your children, but you should keep in mind that while SafeSearch will catch a lot of that inappropriate content, it won’t find all of it. So, it is still a good idea to keep an eye out on things, just in case. Do you need to use a picture on your blog? Then the License feature will be very useful. By clicking on the drop-down menu, you can search for images based on if they are Public Domain, Free to share and use, Free to share and use commercially, Free to modify, share and use, Free to modify share and use commercially. After you choose the kind of image you are looking for, you can rest assure that the ones that show up in the search results are going to be under the same category. Make sure to read the words on top of each section of images. Yahoo Images will not only show you the top searches from the web that is the majority of it, but you will also see top images from Flickr. Displaying images from Flickr is a must here since Yahoo owns the company and its specialty is images. If you don’t see the results you like in the web search results, you can keep clicking on show more images. But, if you click to see more on Flickr, you are in for some treats that will help you find the picture you are High-Quality. They are tools that will help you either find the image you are looking for or find one that is even better. For example, you will find options such as images with Shallow depth of field, black and white, Minimalist, and Patterns. These are options you are not going to see on Yahoo Images. You have to come to Yahoo Flickr for that, and after you see the results it gives you, you will like it. If you click on the Advanced option to the top right, you will see even more options. You can choose to see images in Portrait Mode, Landscape, Square, and Panorama. When it comes to choosing the particular size of the picture, you can only choose between Small, Medium, and Large button as well. Another useful feature is being able to find images that were taken between certain dates. You also have three ways of view your results; you have Thumbnail View, Justified View, and Tile View. This has nothing to do with images, but it does have everything to do with your interests. So, if it’s something you like, you now it is there for future reference. On the top left, you are going to see three tabs, Photos, People, and Groups. If you tap on People or Groups, you are going to be taken to either particular users or groups on Flickr that have to do with the kind of images you are looking for. For example, if you are looking for pictures of French Bulldogs, you will see people or groups that are also passionate about that too. Also Read: What are the Best Facial Recognition Search Engines to Search Person’s Faces Online? Yahoo Images does not get the credit it deserves. It offers some very useful features that you can’t find on Google Images. These features make it fun and exciting to use. Google is just a name that is in more people’s mouths. Hopefully, with time Yahoo will give Google a run for its money. Let’s just cross our fingers that Yahoo can get passed the hacker incident and be a service more people use. I usually search for images on Google, but after finally seeing what Yahoo Image Search can do, I think I’ll give it a try. You can tell that Yahoo tried its hardest to give the users what they want and that says a lot. Some companies give out what they think is best and many not hear what the users have to say about it. What are the Best Reverse Image Search Apps to Do Reverse Image Search? What are the Best Free Online Photo Converter Tools to Convert Photos Online? What are the Best Private Search Engines for Anonymous Web Surfing? What are the Best Deep Web Search Engines to Explore Hidden Web?